Ticket stubs, programme books, posters, postcards and various pretty things I pick up from events on the job. I thought it's be a shame if I stuff them into a drawer somewhere, or worse, bring them home and clutter up my bedroom with it. 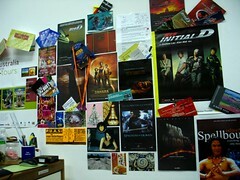 I'm also in the process of turning a side of my desk into a display of of stuff I can't stick on the wall. Although it'll be really funny if I stick the mineral water bottles on the wall.